as seen on: Microsoft Windows [Version 6.1.7601] also known as Windows 7 Ultimate SP1 with automatic Updates enabled. „CBS stands for „Component-Based Servicing“ and it basically (as far as I’ve read) is the way components get installed and uninstalled during updates. It is the reason you see „Stage 1“, „Stage 2“, and „Stage 3“ during the Service Pack 1 install. „Stage 2“ and „Stage 3“ exists for the registry keys and files that are normally locked during regular operation. „Prior to Windows Vista, if you wanted to install optional components, Windows Updates or driver files on your system, the process was fairly simple. In Windows Vista, the new componentization architecture, known as Component-Based Servicing (CBS) changes the way that these components are installed. The CBS architecture is far more robust and secure than the installers in previous operating systems. Users benefit from a more complete and controlled installation process that allows updates, drivers and optional components to be added while simultaneously mitigating against instability issues caused by improper or partial installation. At the top of the stack are the top level clients, such as Windows Update, Programs and Features, and MSI, which deliver packages to a system. The top-level clients are also responsible for control of user input and collection of user preferences during the servicing process. In the middle of the servicing stack is the Trusted Installer, CBS. The top-level clients pass downloaded packages to CBS, which evaluates each individually to determine if they are applicable to the system. For applicable updates, CBS provides the components to CSI, generates appropriate installation events, and registers packages with Programs and Features if needed. Finally, CBS exposes the interfaces to enumerate and inventory the updates. At the bottom of the servicing stack is CSI, which uses the Kernel Transaction Manager (KTM) to do its work. Remove the files or dependencies – files may either be removed from the system completely or may remain in the system store for future use. When a newer version of a component is installed on the system, CSI queries the Component Store to determine what components are being updated. When installing a component, CSI sets up a Primitive Operations Queue (POQ) which contains all files and registry keys that will be installed. Advanced installers or generic commands are then executed to complete installation. Advanced installers run in-process using CMI. If there is a failure during installation of a component, CSI rolls back the entire installation. If a file or process is in use during a component installation and cannot be replaced, generic commands and advanced installer actions are written to %windir%\WinSXS\Pending.xml, and then written to disk on the following reboot. If several packages are installed at the same time, each additional package appends to Pending.xml. 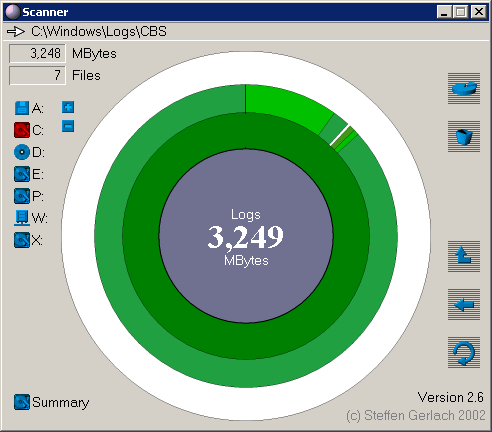 Additional logging during this phase occurs in %windir%\Logs\CBS\CBS.log.